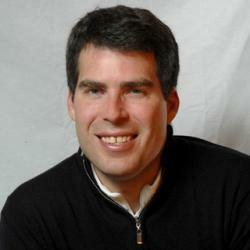 Twice over the summer I expounded on my many reasons for taking a pass on the 2014 Sochi Winter Olympics after attending and working at the last three Winter Games dating back to 2002. Now that the southern Russian spectacle is just a couple of weeks away, the timing seems right to revisit my previous blog posts. 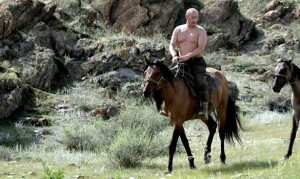 And the horse you rode in on: Russian President Vladimir Putin in all his macho glory. Before I regurgitate my months-old prose, however, it’s important to note that nothing has happened to change my mind and cause me to pick up the phone and call my travel agent. In fact, things seem to be getting worse by the day. First off, President Vladimir Putin continues to go for the gold in what The Daily Show’s Jon Stewart this week dubbed the 2014 Sochi Homophobic Olympics (see video). Putin, addressing some hideously attired volunteers (yes, that’s the same rainbow-colored uni I would have worn for the Olympic News Service), told them that gay people will be safe at the Games despite his nation’s “anti-propaganda” laws. Good to know the Russians won’t be beating up gay people (unless they try to corrupt children), but spectators in general may not be quite as comforted given the chaotic state of security. In the wake of two bombings late last month that killed 34 people in the nearby city of Volgograd, Russia suddenly seems to have realized it should have invested some of the record billions of dollars it’s spending on the Games to obtain high-tech U.S. bomb disruption equipment. Seems it may be a little late for that. Oops, sorry. It just occurred to them apparently that they’re staging the Games in one of the most volatile regions of the world. Finally, and this is by far my most shallow reason for taking a pass, but evidence is starting to leak out that the billions spent on infrastructure aren’t quite turning the mountains around Sochi into a top alpine resort destination on par with St. Moritz, Lech-Zurs, Whistler and, well, Vail. 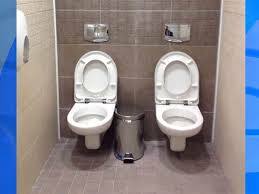 Tandem toilets in a single stall at the cross-country skiing venue. A reporter on the scene already posted a photo of side-by-side toilets in a single stall at the cross-country skiing venue. At past Games in Torino, Italy, and Vancouver, Olympic staff and media have been asked to share rooms and even beds to save the more comfortable accommodations for paying spectators, but never were we asked to share bathroom stalls. It’s only about 720 air miles between Sochi, Russia, and Damascus, Syria – making it very difficult to separate politics from the global cooperative spirit of the Olympic Games that will be staged in Sochi in just under five months. Russian President Vladimir Putin deserves dubious praise for “brokering” if not outright “maneuvering” outraged western powers into accepting a tenuous deal in Syria that will hopefully lead to a United Nations resolution that strips Syrian President Bashar al-Assad of his chemical weapons. Putin would deserve far more credit if he wasn’t making so much money off Assad, pumping weapons into the country and fighting the West at every turn in a blatant bid to keep Assad in power — even as he slaughters women and children with nerve gas reportedly provided by Russia and other Western European nations. Earlier this summer I listed a number of reasons I wasn’t trying to find work at the Sochi Winter Olympics (I’ve attended and written about the last three), but that blog came out before the laughably macho Putin signed an anti-gay law that has garnered global outrage. One is not supposed to politicize the Olympics, but some acts are so tone-deaf to civilized sentiment that they simply must be vilified. Putin, besides trying a little too hard to demonstrate his heterosexuality, forced so many people to take a stand right before a major international event. In America, where even Republicans are admitting they’ve been wrong on gay rights and professional athletes are finally starting to come out, it’s impossible not to condemn Putin’s actions. I don’t advocate for a boycott (because that ultimately hurts the athletes most), but I hope we see protests akin to civil rights demonstrations at the Mexico City Olympics in 1968. The 1980 U.S. boycott of the Moscow Games was a mistake, as was the reciprocal Soviet boycott of Los Angeles in 1984. Both stemmed from a Russian invasion of Afghanistan and U.S. funding of the Mujahideen who ultimately sent the Soviets packing. That war gave rise to jihadists such at Osama bin Laden. So soon after the 9/11 anniversary, it’s hard to ignore the unintended consequences of fighting proxy wars in the Middle East or Central Asia. Just a year after the last Olympic Games on American soil (Salt Lake City in 2002), the U.S. invaded Iraq to strip Saddam Hussein of weapons of mass destruction that he never really possessed. And many on the right insist to this day that Hussein was somehow behind 9/11 – a notion that U.S. intelligence later definitively disproved. Is it coincidence that the U.S. hasn’t come close to landing another Olympic Games since the ill-advised invasion of Iraq – a war that cost billions in American capital, eroded U.S. credibility and didn’t really improve the overall security and stability of that country or the region? Perhaps there should be a price to be paid for bad foreign and domestic policies. I, for one, couldn’t in all consciousness take money from the organizing committee of a nation that so openly endorses homophobia and bigotry. Nor do I think Putin’s private Games along the shores of the Black Sea should be heralded as anything but a multi-billion-dollar exercise in excess and a platform for his regressive agenda. And yeah, I like American vodka a lot more than the Russian swill. For the first time since Nagano, Japan, in 1998, I won’t be attending the Winter Olympics next ski season. I worked as a writer at the last three Winter Games – Salt Lake City (2002), Torino, Italy (2006) and Vancouver (2010) – but will take a pass on Sochi, Russia (2014). My reasons are mostly personal, like not wanting to abandon my family for weeks on end during the school year and the peak of our own ski season here in the Vail Valley. But I’d be lying if I didn’t add that corruption, construction chaos, likely coastal weather concerns and potential for security mayhem also all factored into my decision not to pursue a gig at Sochi – a Black Sea resort with more palm trees than pine trees. I’ve gone on the record advocating for high-alpine Winter Olympic venues that avoid the coastal mushiness of places like Whistler, where fog and soft snow plagued the alpine ski-racing events. But nobody at the International Olympic Committee was listening, and so Russia is stockpiling snow and planning for temperatures in the 60s. Last week, opponents of Russian President Vladimir Putin claimed that up to $30 billion of the overall $50 billion Olympic fund had gone missing – most likely siphoned off by Putin cronies. That could have some serious infrastructure ramifications for surrounding mountain resorts that have been basically rising out of the mud since 2007. And let’s hope a lot of that missing money wasn’t earmarked for security, because Sochi is in one of the most volatile regions of the world. Russia has been cracking down on Islamic separatists in the area, but concern is running high after ethnic Chechans so easily bombed the Boston Marathon this spring. I hope these Games go off without a hitch and I’m proven wrong. After all, I had similar concerns amidst the chaos leading up to the Torino Winter Olympics in 2006. But I think the best seat in the house for Sochi in 2014 will be in front of a tape-delayed television broadcast. If you’re really dying to see (or ski) that part of the world, do it well before or after the Olympics have left town.